Yes, I know it’s 100 degrees outside. It’s also hot in Tunisia, from where this recipe gets its inspiration. Shakshuka is a traditional Tunisian breakfast composed of simmered tomatoes, peppers, aromatics and poached eggs. It’s meant to be spicy which is a nifty DIY method for keeping cool in the Saharan heat. (The more you sweat, the more you cool off). As for me, I’ll take anything spicy for the sake of spice, regardless of temperature and geography – especially when it’s screams comfort food like this. 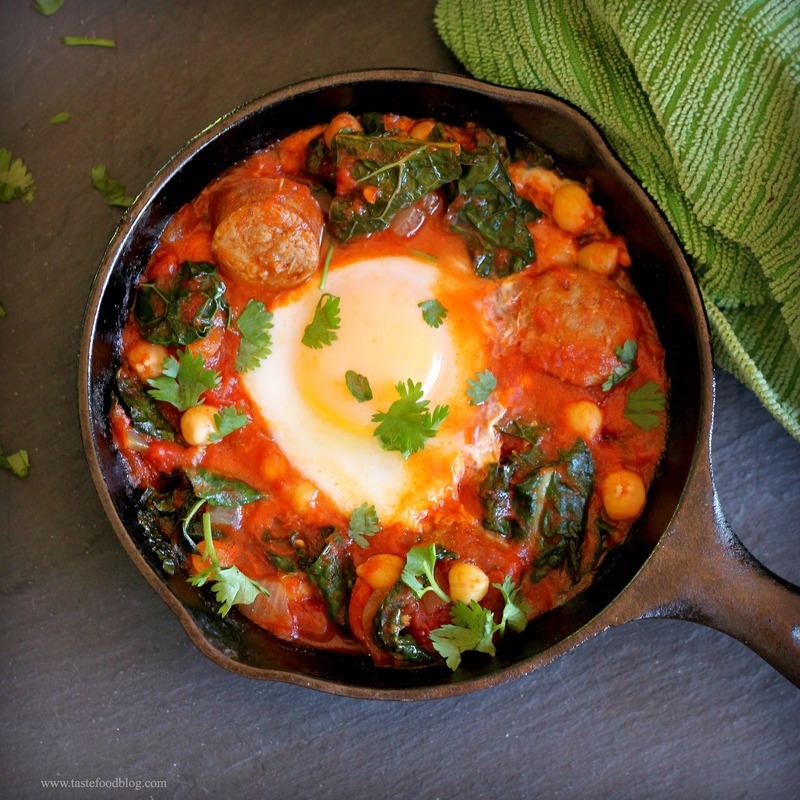 The Tunisians call shakshuka breakfast, but I’ve added sausage, kale and chickpeas (why hold back?) and prefer to call it dinner. It’s delicious as is, served with crusty bread for mopping up the sauce and yolk. For a complete meal, spoon prepared couscous into shallow serving bowls. Make a well in the center of the couscous and ladle the ragout and and egg into the center of the couscous. All you need as an accompaniment is green salad, chilled wine – and a fan. 1. Heat 1 tablespoon olive oil in a deep oven-proof skillet over medium-high heat. Add the sausages and brown on all sides, about 4 minutes. Transfer the sausages with a slotted spoon to a plate lined with a paper towel. Discard the oil from the pan, but do not rinse out the skillet. 2. Add 1 tablespoon olive oil and the onion to the skillet and saute over medium heat until the onion begins to soften, about 2 minutes, scraping up any brown bits. Add the garlic, paprika, and cumin and cook until fragrant, about 30 seconds, stirring constantly. Return the sausages to the pan and add the tomatoes, chickpeas, and salt. Stir to combine and taste for seasoning. If more heat is desired, add the harissa or hot sauce to taste. 3. Simmer the ragout, partially covered, over medium-low heat, to slightly thicken and allow the flavors to develop, about 20 minutes, stirring and breaking up the tomatoes with a spoon. Stir in the kale and cook until slightly wilted, about 2 minutes. 4. Make an indentation or well in the ragout with a spoon. Crack one egg in a small bowl and gently slide the egg into the indentation. Repeat with the remaining eggs, taking care to not overlap the eggs. Cover the skillet and simmer over medium-low heat until the egg whites are set but the yolks remain runny, about 10 minutes. 5. Remove from the heat. Serve family style or spoon the ragout with one egg into individual serving bowls. Garnish with chopped fresh cilantro or parsley. OK, gorgeous and push me past my gag reflex on a poached egg. Silly, yes? I love anything with a soft, runny egg on top. International comfort food at its best! It’s my kind of breakfast Lynda, baked eggs with some sort of a spicy tomato salsa… Mr loves chorizo, so this would taste fantastic for him too. And Kale? Brilliant. Wow, this sounds delicious! It’s a big skillet of some of my favorite things! I’ve been dying to try shakshuka…perhaps this special recipe will finally push me to do it.